The accessories included with this microscope consist of three objectives with canisters, a matched pair of eyepieces, a single higher power eyepiece, a stage forceps, a hand forceps, a live box, a sub-stage polarizer, a nosepiece analyzer, a camera lucida, a silvered side reflector, a sub-stage aperture wheel, and a free standing bullseye condenser. This particular version of the Student Model was made with a mechanical stage. 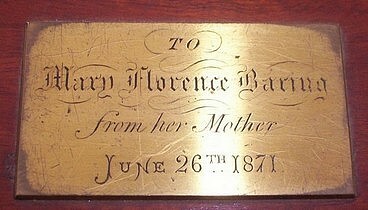 A plaque on the cover of the case bears the inscription: To Mary Florence Baring from her Mother June 26th 1871. Miss Baring was age 11 when she was given this birthday gift. In later life, she was the 5th Marchioness of Northampton. 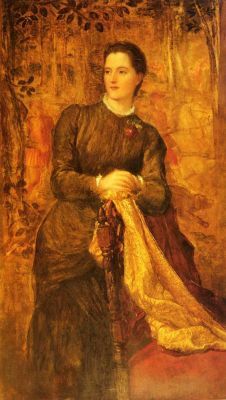 She died in 1902. Also, see this. Henry Crouch's Student's Binocular. 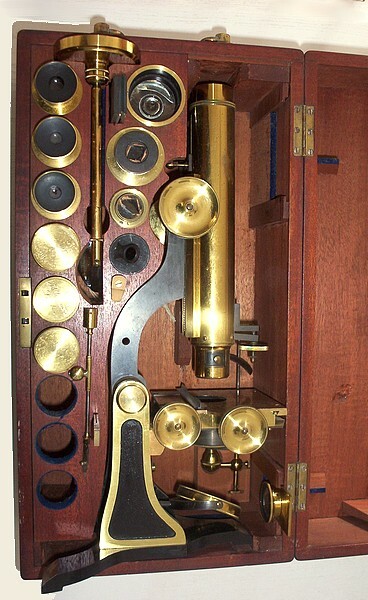 - This instrument was devised at a time when the construction of the Binocular was still almost exclusively confined to the makers of First-class instruments; and it had the great merit of bringing within reach of the Student a convenient and well-constructed Binocular, at a cost not greater than that originally charged for the addition of the Wenham prism and Secondary body alone. With the improvements it has since received, it still remains one of the best instruments of its class; and the Author, after considerable use of it, can strongly recom mend it to such as desire to possess a Binocular at once cheap, good, and portable. Its general arrangement, as shown in Plate III., corresponds closely with that of the small Microscope of the same maker already described; the double body being supported on a ' limb' on the Lister model. The adjustment of the Eye-pieces for the distance of the eyes is made by a transverse bar which is attached to one of them, and which works through a slot-piece fixed to the other; so that if by the application of the finger and thumb to the projecting pin, the bar with the attached eye-piece be raised or lowered, the other eye-piece also is moved accordingly. The Stage resembles that of MM. 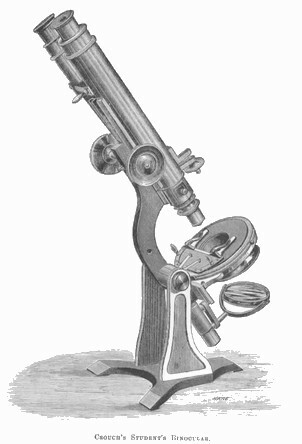 Nachet's Microscope (Fig. 39). It is of black glass, of circular form, and works with the like freedom and smoothness; and rotates in a manner similar to that of M. Nachet, of which it is a modification. It has also a similar object- holder. - An Achromatic Condenser, Polarizing apparatus, &c. can be added to this instrument; and it is then as well adapted to all the ordinary purposes of scientific investigation as those of much higher cost, while it has the advantage of lightness and portability. This is one of the best instruments of its class in use, and we strongly recommend it to such as desire to possess a Binocular at once cheap, good, and portable. Its general arrangement is shown in the illustration above, the double body being supported on a "limb" on the Lister model. The adjustment of the eye-pieces for the distance of the eyes is made by a transverse bar which is attached to one of them, and which works through a slot-piece fixed to the other; so that if, by the application of the finger and thumb to the projecting pin, the bar with the attached eyepiece be raised or lowered, the other eye-piece also is moved accordingly. The stage is circular in form, and consists of a plate of polished black glass, over which the object-holder slides in every direction with the greatest facility, and is so arranged as to afford entire concentric rotation in the optic axis ; an indispensable feature in a good Binocular instrument. 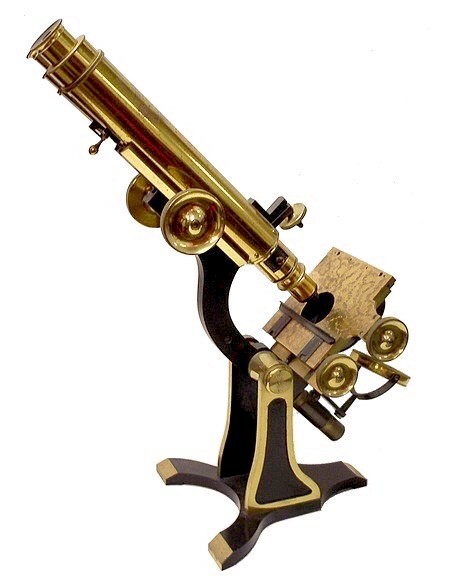 This Microscope in its "Binocular" form, the first introduced to the scientific public at a reasonable cost, has steadily increased in reputation, and has now attained the highest position of any microscope of its class. Its thorough excellence of performance, stability in any position (in this respect being unrivalled), simplicity of construction, and consequent non-liability to derangement, render it by far the most perfect working microscope extant. It has now for many years been favored with the approval of Dr. Carpenter, as his own working microscope, and was the instrument selected for use by him on the important expedition of H. M. S. "Porcupine."